Of course I can help! I live for this stuff!! Here are the photos Kim sent me of her stairs in their current state. The first thing I would do for this space, would be to paint it. 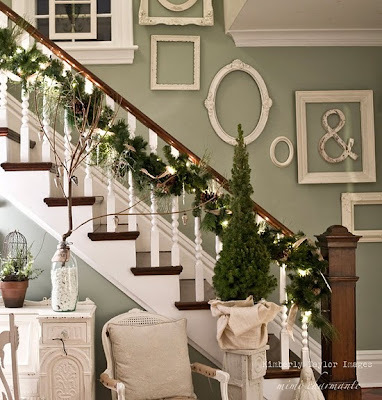 My suggestion would be to continue that fabulous green from the downstairs wall up the inside of the stairwell. This would have the effect of making the stairs a part of the living space rather than pointing out their utilitarian side. One of my favorite looks for a staircase is a collage. Now Kim could go with the idea she started...a family photo collage. And this could be outstanding. She would just need to take it to the next level. If Kim wants to use this idea, I would suggest sticking with one photo color....either all black & white or all color. 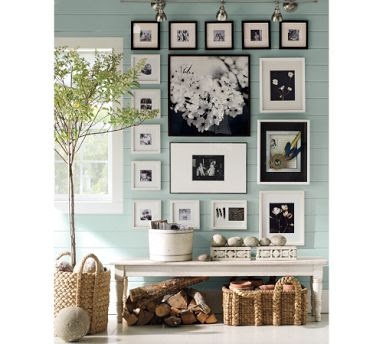 Frames don't necessarily have to match, but keeping the photos in the same tone helps to create a cohesive feeling. And Kim, go for broke. Don't chicken out with just a few photos. And don't think you have to only have photos of the family. You can throw in a pretty art print. Or something a little unexpected like marquis letters. Check out these two examples from the Pottery Barn catalog. 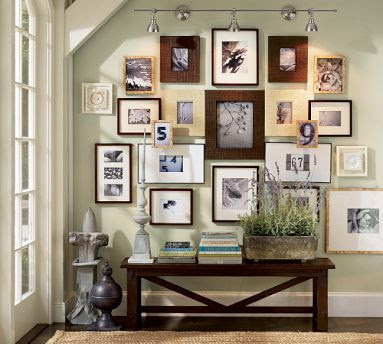 Another fabulous look, is to hang a collage of empty frames all painted one color. I love this look because it creates "architecture" where it didn't exist before...similar to putting up mouldings. Here are a couple of my favorite examples of this look. I personally like the idea of using a mirror collage in a stairwell. This helps to bounce light around and makes what could be a dark spot lighter! Although my personal preference is to use frameless mirrors like the ones pictured from Pottery Barn, any mirror will do the trick. Just look for some with unique shapes or frames to create interest. But if Kim would rather do away with the collage look, she could try using one large statement piece. I have always loved this stairway from Brooke Gianetti's home. The giant clockface is amazing. 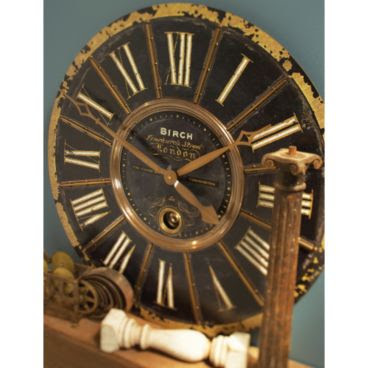 Because a huge vintage clockface might be difficult to locate ;-) Kim might consider purchasing a new large clock online such as this one from Ballard Designs. And because I like to offer inexpensive design solutions, Kim might also consider finding a fabulous piece of fabric and simply wrapping it around a wood frame or canvas. This is one of the least expensive ways to make a large "statement" piece of art. Finally, you may have noticed the little basket at the base of the stairs. From a mother's point of view I totally understand needing a catchall. 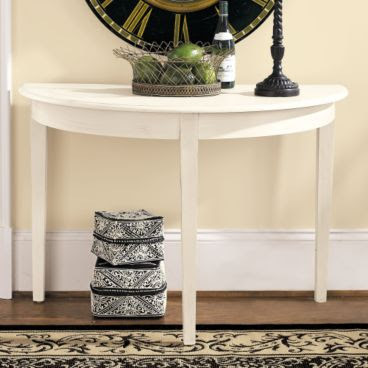 And since the landing looks to be fairly substantial, why not consider adding a small demilune table like this one from Ballard design on the wall facing the long staircase? And add a pretty basket or hatbox underneath to stash whatever stuff needs to find it's way upstairs! I hope these ideas help Kim and anyone else out there who needs a little stairwell inspiration!! A little sidenote: Serena & Lily featured yesterday's post on their Facebook page! And for anyone that wonders...No, I am not being paid by Serena & Lily...I just love their stuff. But if anyone from Serena & Lily happens to be reading this....I know of a master bedroom in desperate need of a king size ruched quilt and a sparrow chair. ;-) Just sayin'. Great, Great ideas! You inspire me! 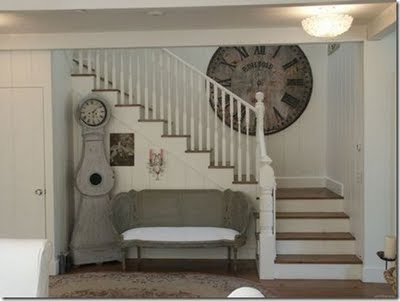 Hey sweet Wendy...so fun that you are talking about foyers, i just posted about our foyer remodel...we used trim up the stair case to fill in all that dead space. Love it! Come check it out. I just did a photo collage - all black and whites, different sizes and added in some of kids artwork through the years. It looks amazing and I get compliments whenever someone comes by! I love that big clock! I have a photo collage going up my stairs - all black frames in varying sizes and such. Love the way it looks and it's fun finding the different sizes and shapes to add to the collection. I'm inspired! My stairwell needs loads of tlc. Thanks Wendy! Those were great ideas! I think you've inspired more people than just Kim. Love the empty frames! Might have to give it a try on my LARGE blank staircase wall! You seriously are such an amazing and beautiful decorator. I might need your help with my house now that you are in the area. :) It seriously needs help. I LOVE them all. I would never be able to decide. If your just handing out free advice I am having mantle drama. Ill send you some phone pics. Lovin You!!! Those are all wonderful ideas. Great inspiration. What great ideas! I have been looking for some ideas up my stairwell, too. I will have to think about using some of these thoughts. It can be such a challenging space to decorate. Kim's my wonderful neighbor and I can't wait to see which idea she chooses. They are all great and any of them will look fabulous in her house. I'm partial to the clock. Oh, thanks so much for the inspiration! 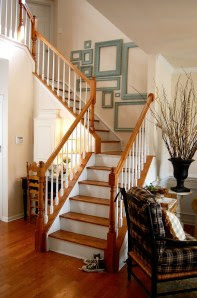 I have a 2-story stairway wall just ACHING for something like this. Love this ideas!